The perfect Springtime invitation for two “Love Birds”. Cute and elegant! To view our extensive portfolio or to customize your own, please contact us at http://www.VibrantWeddings.com, email us at avibrantwedding@gmail.com or call us at (619) 852-6886. $4.50 per invitation suite for a set of 100 invitations, fully assembled. Included are 5×7″ Double-mounted Invitation, 3.5×5″ Single sheet Response card, and two blank matte envelopes (White or Ivory, or Blush). All of our invitations can be customized in any color and style of choice. Different invitation sizes and shapes available. 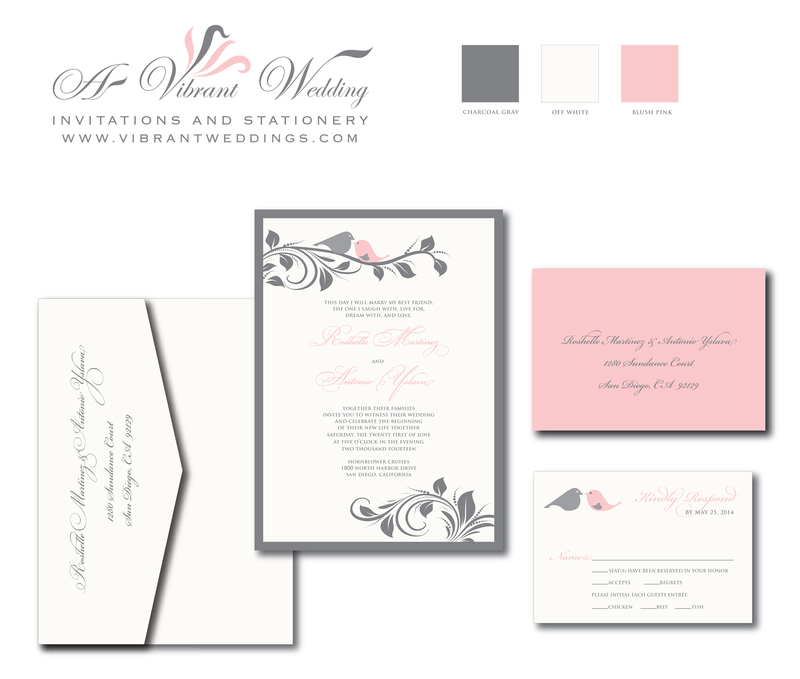 Try a single-layered flat style invitation for a less expensive alternative or upgrade to a pocket-fold style.